I was home for Thanksgiving--Fort Myers, FL--God's waiting room. Five Guys was a trek, so I decided to brave a Steak 'n' Shake with Happy Meal. I was planning on choking down a miserable, fast-food shame and rage sandwich, but this turned out to be a damn fine cheeseburger. I got the Double Steak Burger. Pretty DARN good. Two razor thin patties of average quality beef. A nice crust from the griddle. The burger meat was pressed flat with a sizzling grilling weight. This achieved a crunchy sear on the uneven loosely formed patties. The cheese--American--melted perfectly on the drive home. This cheeseburger was satisfying as hell. It was a step below Five Guys in terms of value and quality of ingredients, but it also saved me a 5 mile drive, so it was a draw. On the plus side, the gave Happy Meal some cool swag, so that kept him busy while we were awaiting our freshly cooked burgers. BONUS--The Fort Myers, FL Steak 'n' Shake was open 24 hours. Morbid obesity was tough to avoid. 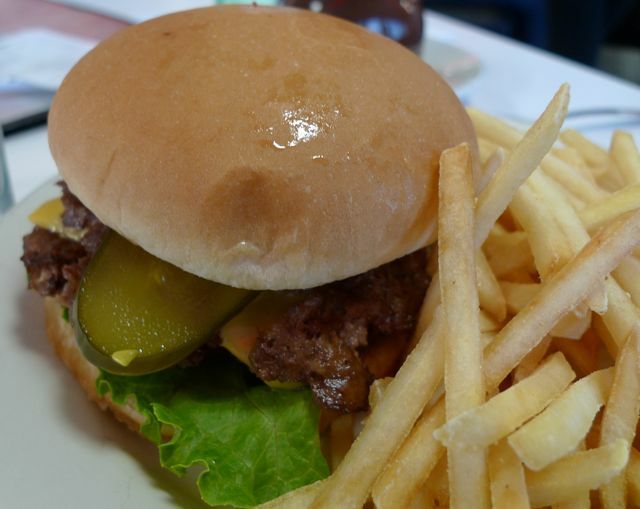 Burger Review : A damn, fine fast food burger--Want.